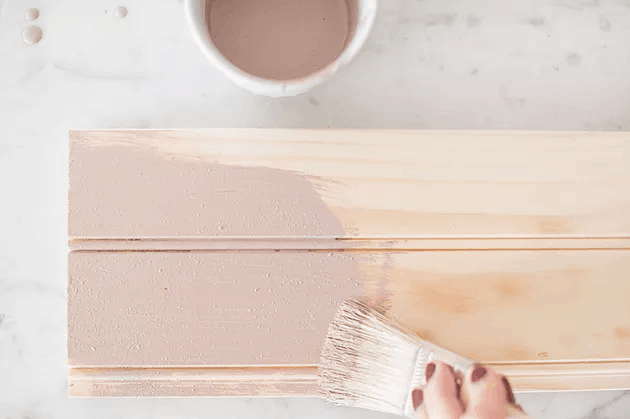 Which Milk Paint Should You Use? I carry two wonderful paint lines in my retail spaces. 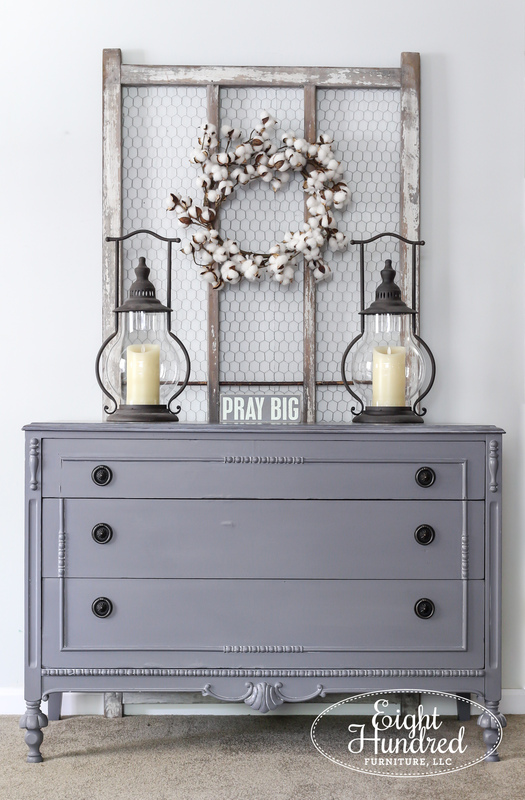 …and Miss Mustard Seed’s Milk Paint. Both of these paint lines have fabulous properties and are well-suited to different looks and surfaces. 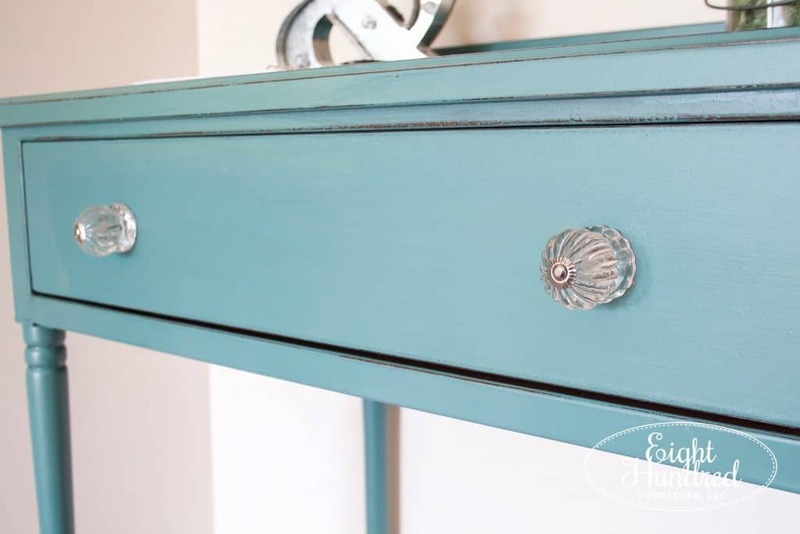 The purpose of this blog post is to help you determine which paint product you should choose for your next paint project. I’m going to start with General Finishes Milk Paint because G comes before M.
Yep…it’s all about the alphabet! 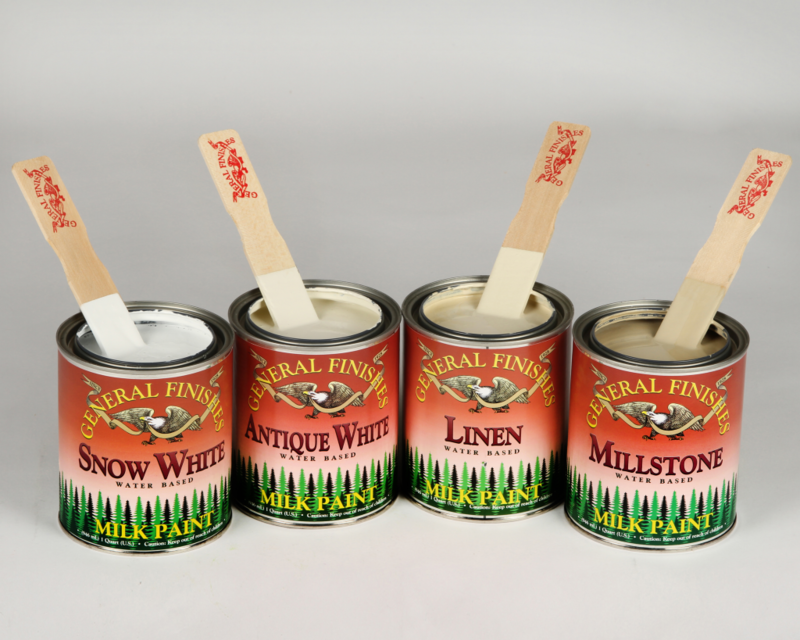 To begin, General Finishes Milk Paint (GFMP) isn’t actually a true milk paint. It’s an acrylic based paint that dries to a durable finish somewhere in between a flat and a stain sheen. 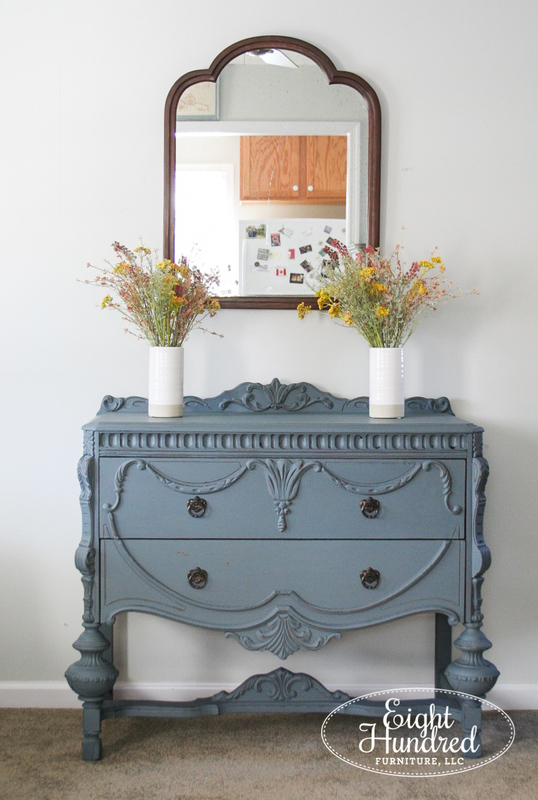 It’s called “milk paint” because it mimics the low luster sheen of old world style paint. 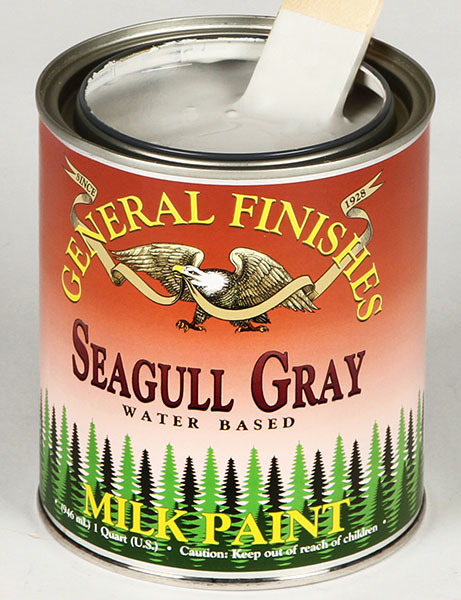 GFMP comes in a can and is pre-mixed, making it a good paint for folks who have never painted furniture before. It’s pretty easy to get started – just crack the can open, stir, and go! GFMP is also self-leveling, making it an easy paint to apply. Simply brush it on, watch for drips and leave it alone! It will naturally level itself out and tighten down, leaving you with a super smooth finish that’s virtually free of brush strokes! 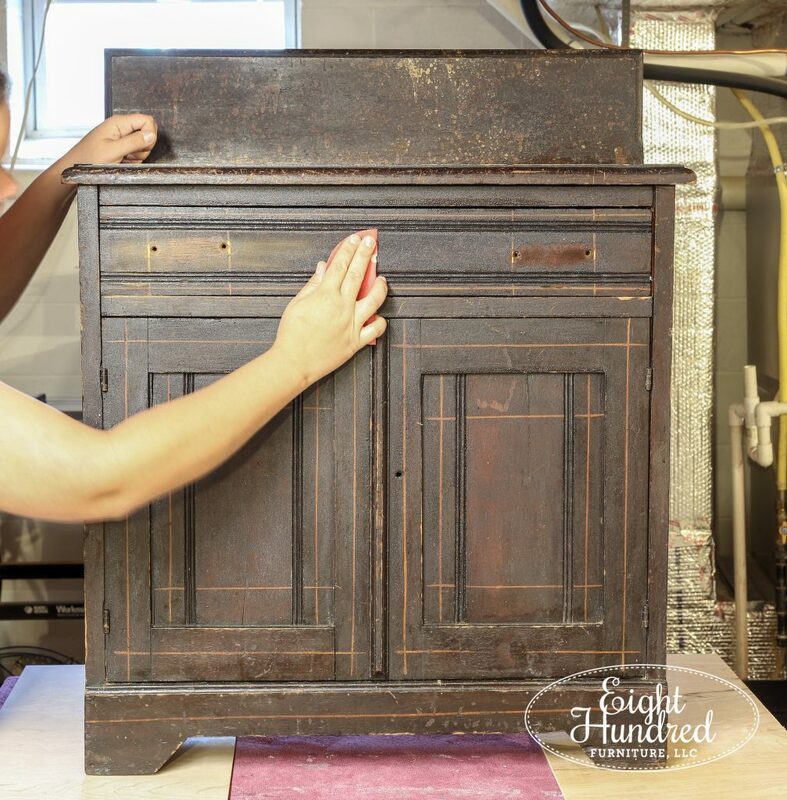 If you want a distressed look, it’s easy to sand. It’s also water-based, making it very easy to clean up with soap and water. 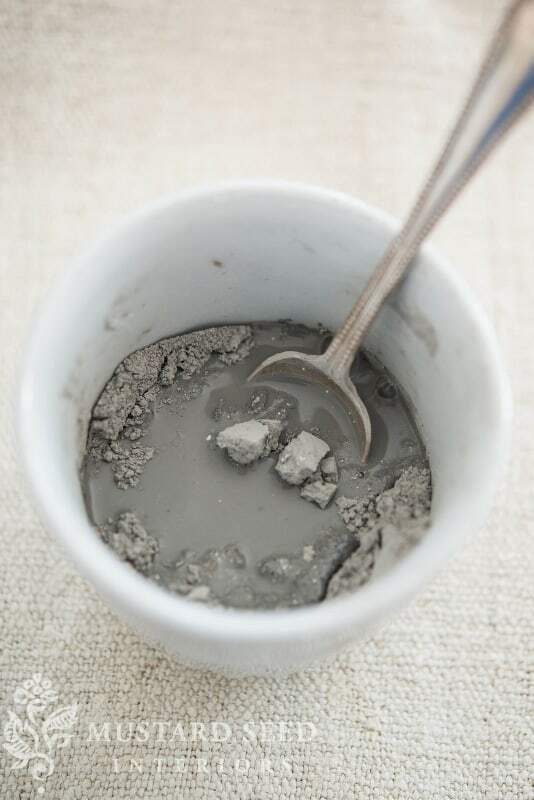 It’s also a low VOC paint product, so if you paint inside (like I do), you don’t have to worry about harsh fumes! There’s virtually no odors! GFMP is an exterior-rated paint, so it’s suitable for indoor or outdoor use. It’s also great for using on cabinetry and millwork! To see examples of kitchens and baths that were refinished using GFMP, you can visit their Design Center. There are professional cabinet painters who make their living using GF products for their business, so it’s definitely a top-rated product! One of the most common questions I ask my customers when they’re trying to decide between my milk paints is what kind of coverage they want. If they want clean lines, no distressing and full coverage, I steer them towards General Finishes. This paint doesn’t do the chippy look and is ideal if you want a more clean and more modern finish. 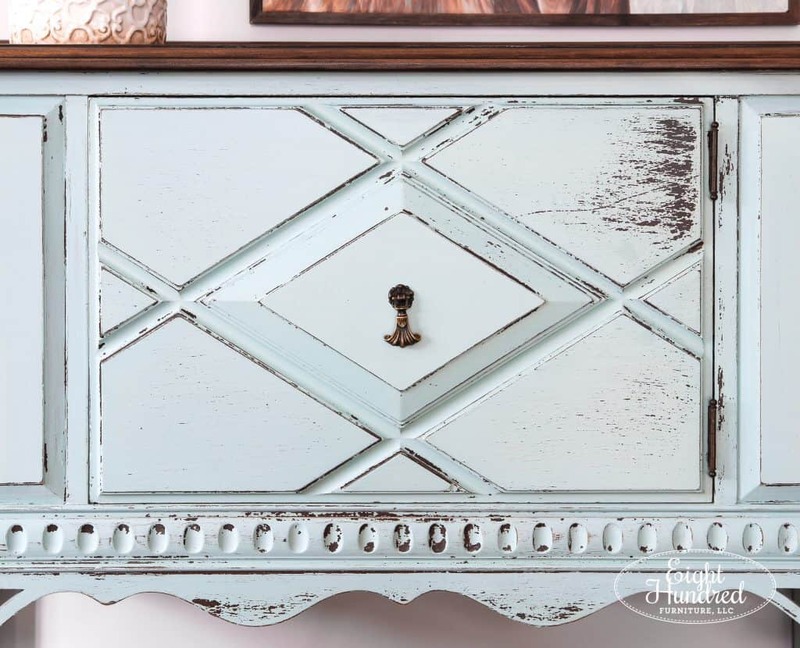 You can always add rustic touches with distressing and glazes, but for the most part, General Finishes Milk Paint will give you consistent color, amazing coverage, ease of use and clean lines. All of that convenience comes at a price. GF is more expensive than Miss Mustard Seed’s Milk Paint simply because it’s a more expensive product to manufacture, package and ship. 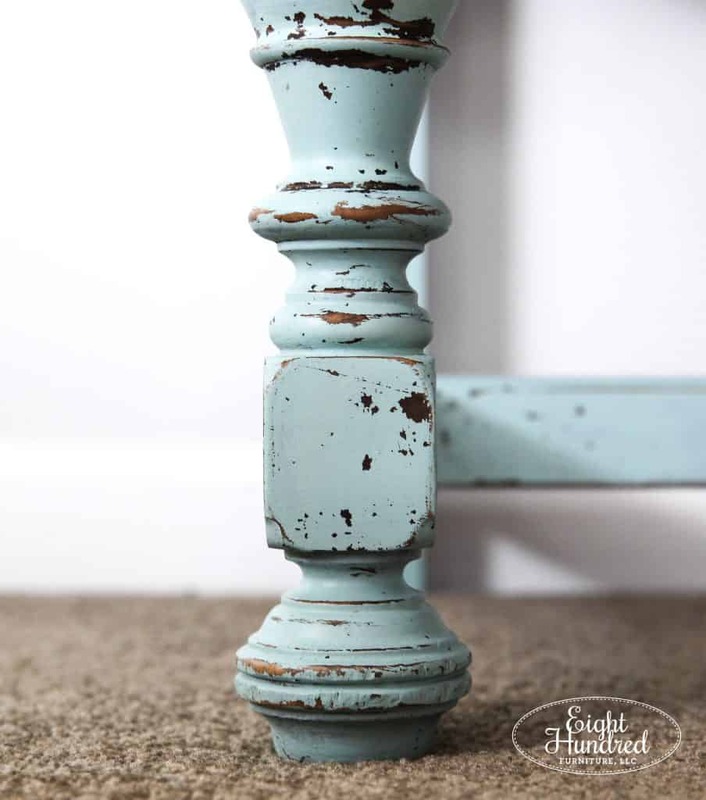 So now that you’re versed in General Finishes Milk Paint, it’s time to switch gears and talk about my first love, Miss Mustard Seed’s Milk Paint! 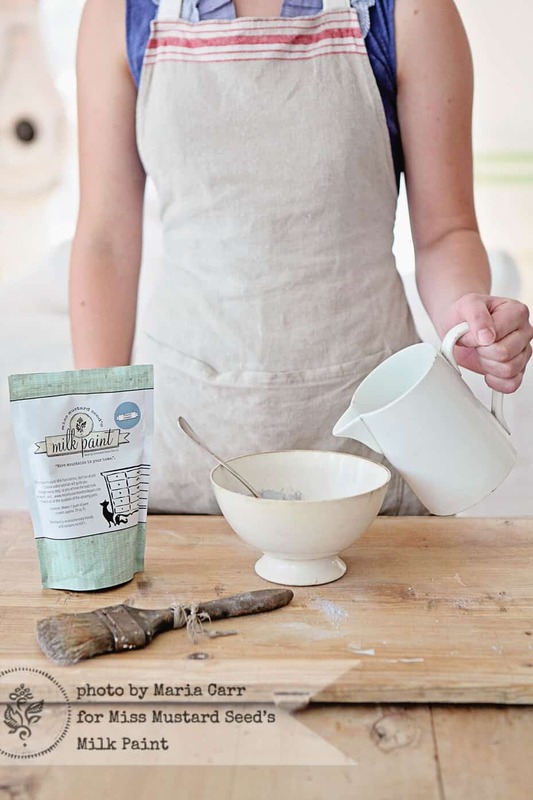 Miss Mustard Seed’s Milk Paint is a true old world style milk paint. It’s the real deal, folks! This paint comes in powder form and has 5 ingredients – chalk, clay, limestone, pigments and powdered milk protein (called casein). 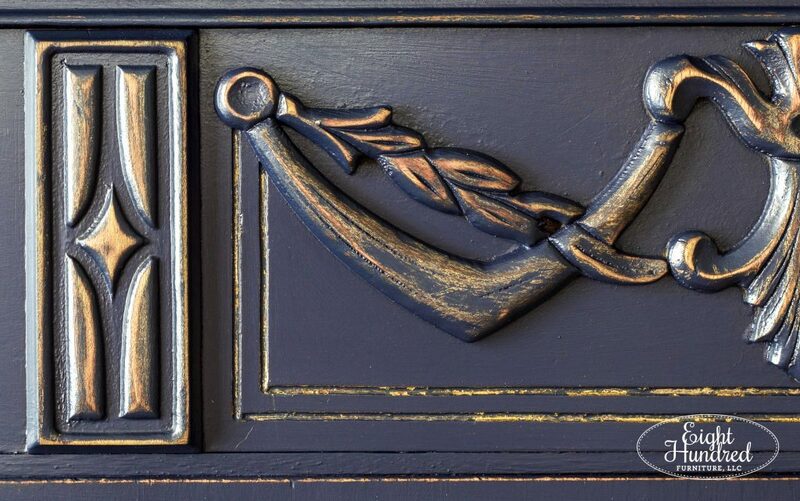 The casein is what puts the “milk” in Milk Paint! 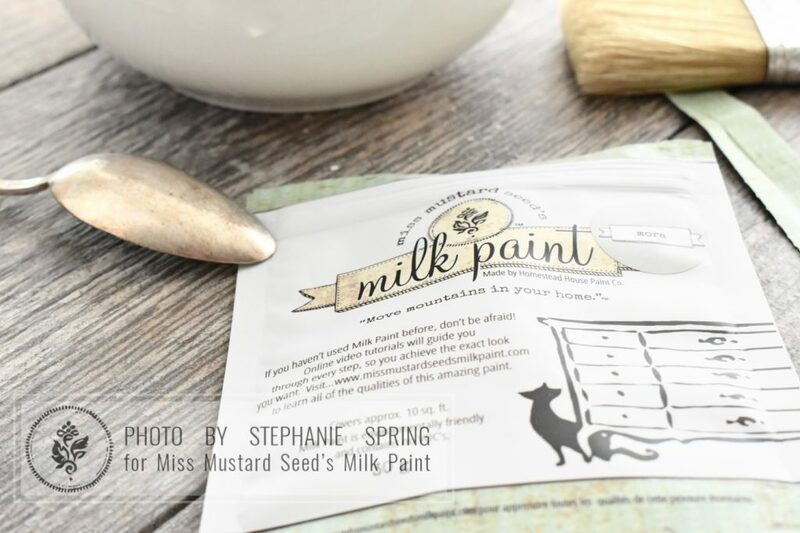 Miss Mustard Seed’s Milk Paint is sold in powder form in little pouches, so it does not come pre-mixed. 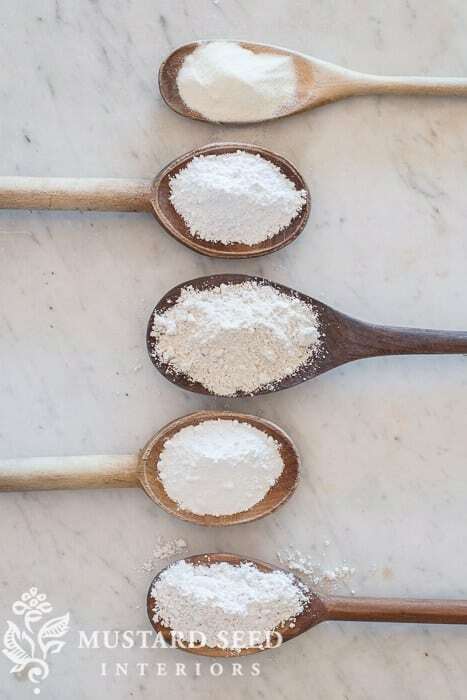 Because it’s sold as a powder, it has an indefinite shelf life (until it’s mixed with water). 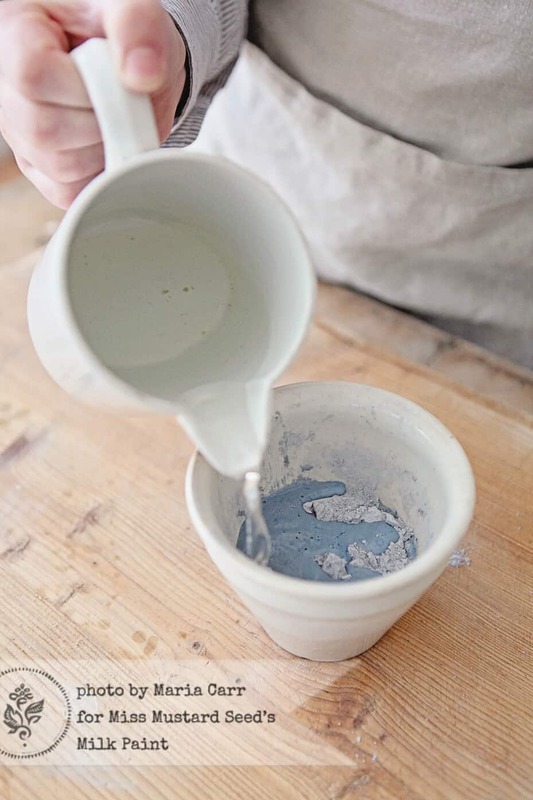 When you’re ready to paint, simply mix equal parts powder with water and give it a stir. Voila! You’ve got paint! 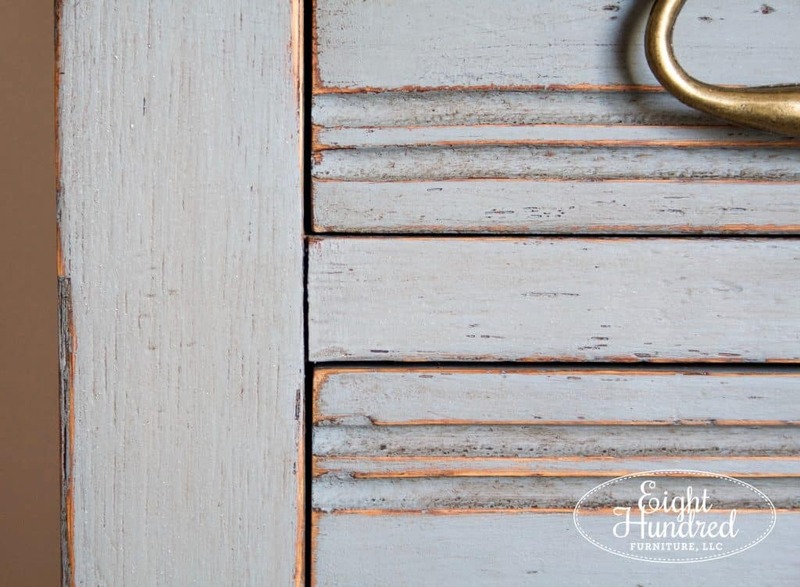 As you can see, the consistency is much thinner than modern pre-mixed paints (such as General Finishes Milk Paint). That’s one of the major differences with this brand, along with the fact that it’s sold in powder form. When MMSMP is painted out, it has great coverage despite its thin consistency. 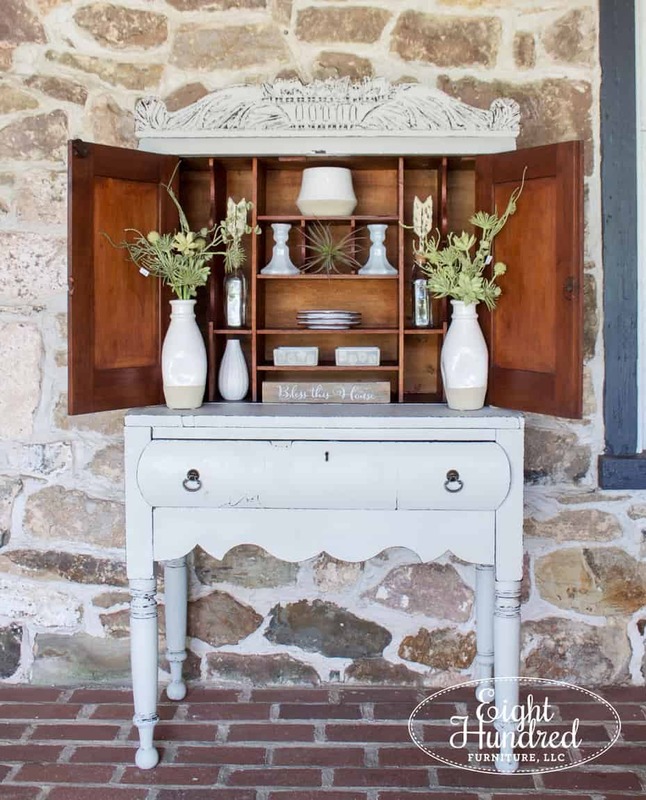 Back in the day, people used milk paint. Nothing else was available! It’s an ancient form of paint that goes back thousands of years. It has actually been found in cave paintings! 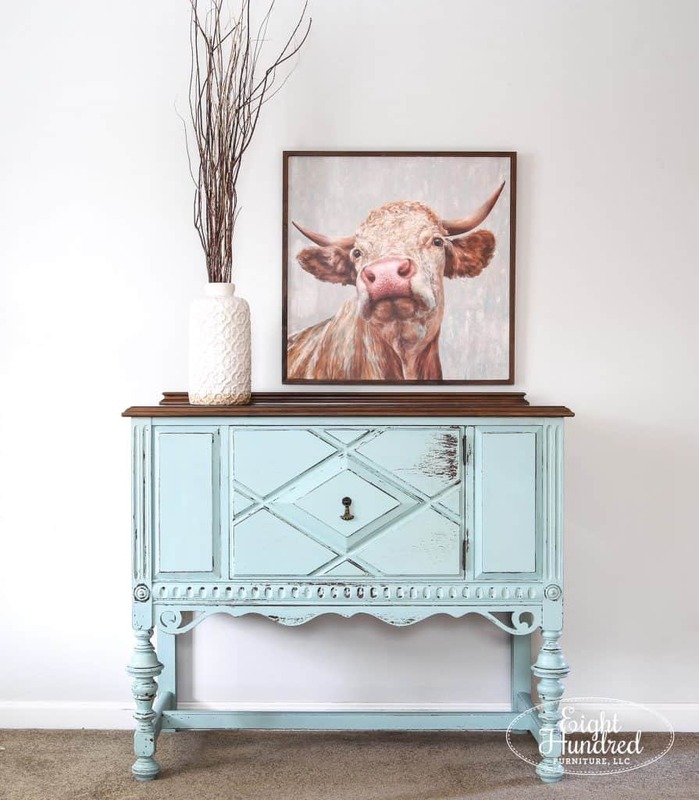 So while Miss Mustard Seed’s Milk Paint is a modernized version of this ancient painting tradition, the style of milk paint dates waaaaaay back in time. 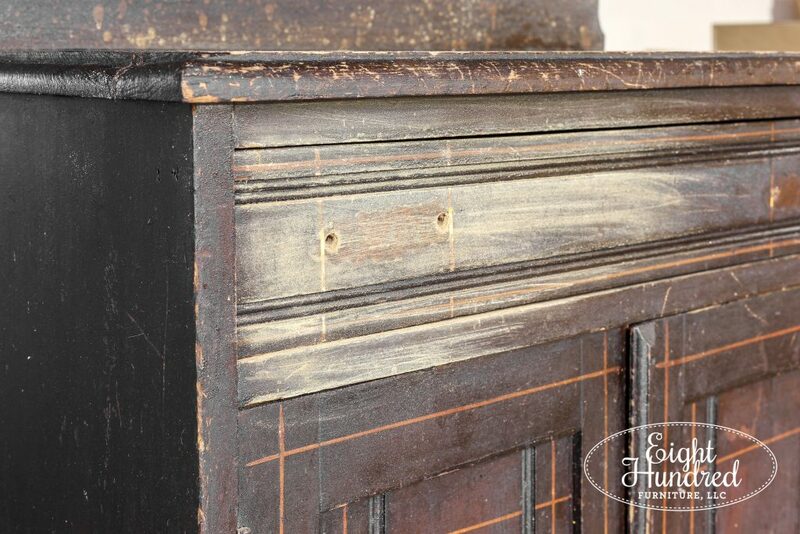 This makes it an ideal style of paint to use on old pieces of furniture! Raw wood surfaces are excellent contenders for MMSMP because it soaks in right away and actually behaves more like a stain than a paint. It kind of becomes “one with the wood” and does not lay on the surface like a modern paint does. 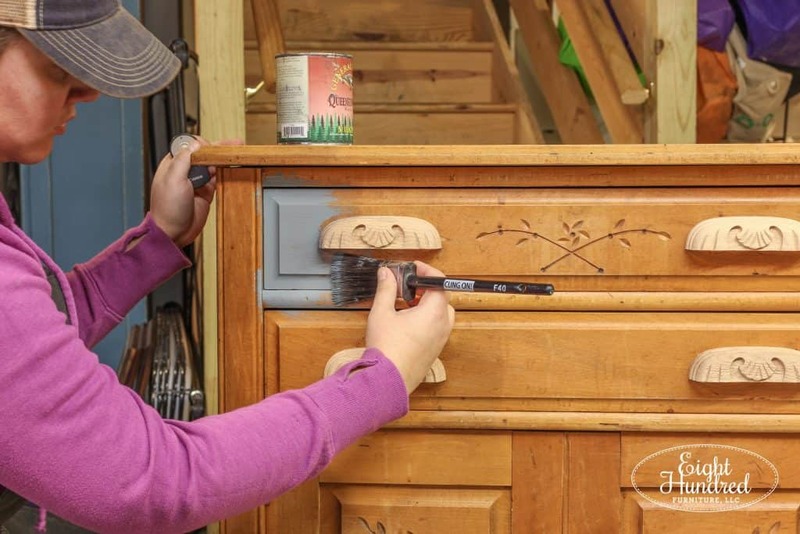 This paint attribute preserves the grain, texture and other features of your wood while still giving you great color. On surfaces that already have an existing finish (like most modern furniture), MMSMP will naturally chip and resist any spots that are slick or shiny. The overall effect can be quite charming on the right piece! Now it doesn’t always do this, but that’s part of the unpredictable nature of using MMSMP. 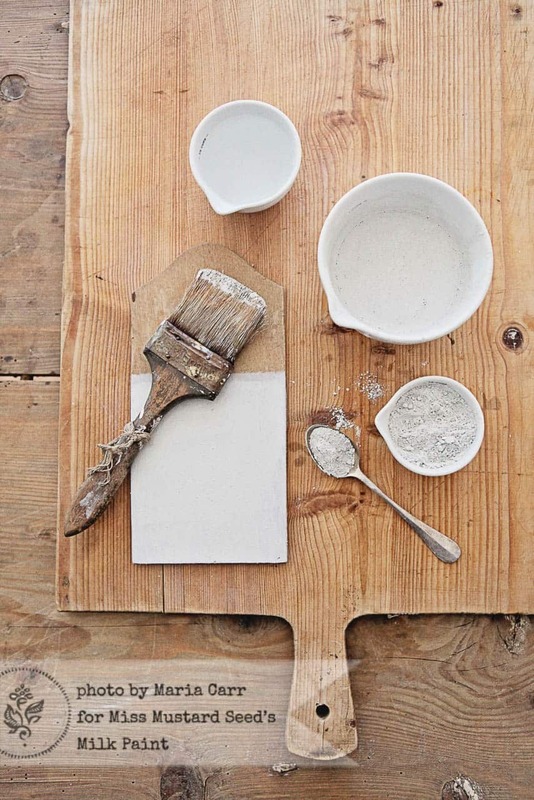 Because it’s such a simple paint with basic ingredients, it sort of has a mind of its own. A beautiful mind, but a mind of its own nonetheless. Where, when and to what extent it chips is completely random, which can be exciting when it happens! But, on pieces where you want more control, chipping can be quite frustrating. The difference between a chippy and a non-chippy finis lies in the prep work you need to perform for your piece. Giving your surface a good scuff with sandpaper will help MMSMP adhere better and chip less. 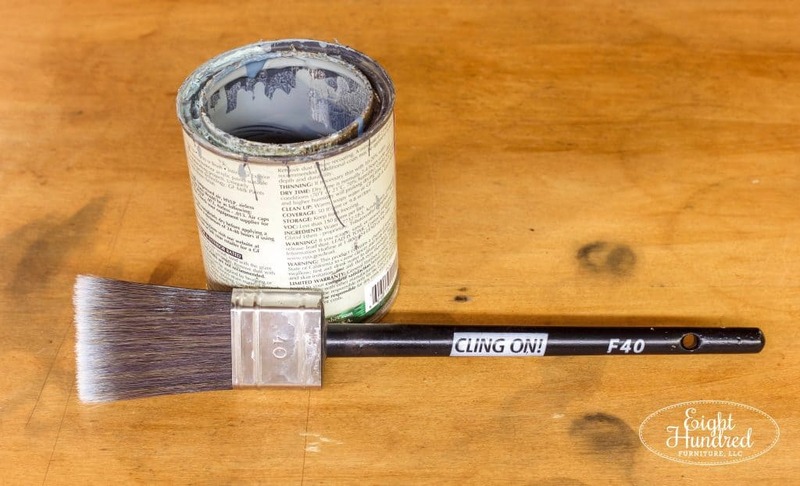 You can also add a bit of a product called Bonding Agent into the paint to help it stick. This is a big difference between MMSMP and GFMP! Prep work is still needed when you’re using General Finishes, but the sanding aspect is much less intense. Plus, the sanding is meant to clean your surface, not help the GFMP adhere. GFMP has excellent adhesive properties, so all it needs to “stick” is a clean surface free of oil, wax, dust and dirt. Another super fun aspect of MMSMP is that is has natural variations in the color. 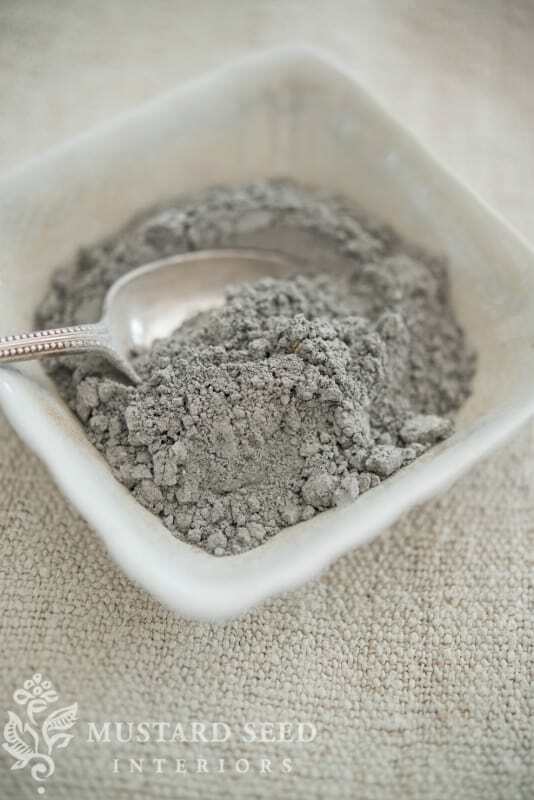 Because it’s a powder you mix by hand with water, the pigments don’t all get dissolved evenly. 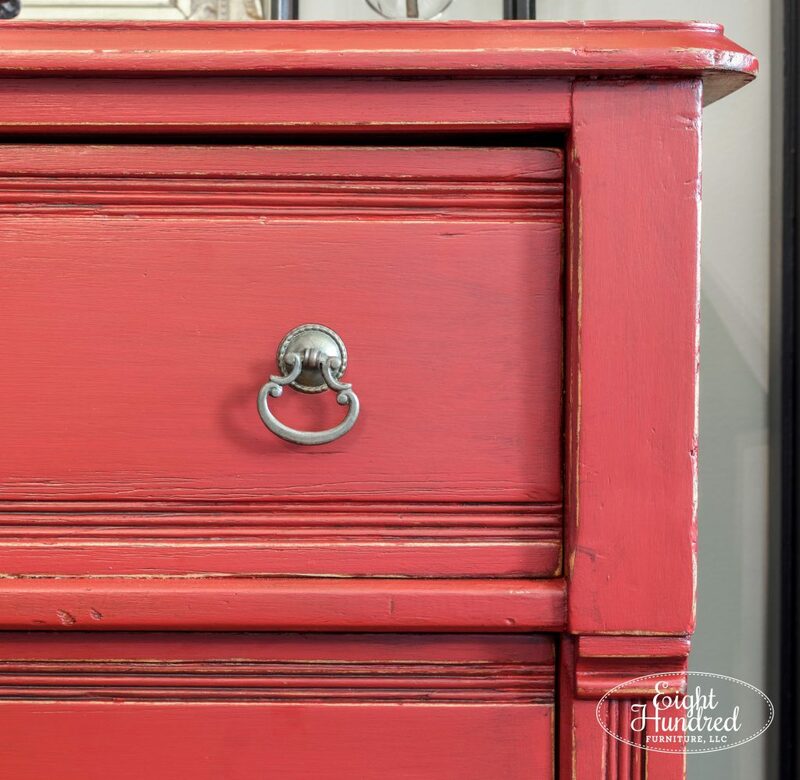 This results in gorgeous variations in paint color across your piece, adding to the aged feeling. It’s not super obvious, but upon closer inspection, you can see beautiful streaks of color here and there that’s just charming! So long story, I recommend MMSMP for raw wood projects and really old pieces of furniture. If you want a farmhouse look or an authentically aged finish, MMSMP is the winner, hands-down. Plus, the painting experience is 180 degrees different than modern paints because you are involved every step of the way. You’re measuring powder, mixing it with water, painting it out, smoothing it down and watching it crackle and chip all on its own. You also need to remember that MMSMP is not a modern paint, therefore it will not behave like one. It’s unpredictable nature is built-in. If it chips, it’s doing exactly what it’s supposed to do by nature. So make sure that you have reasonable expectations for this paint product when you embark on a MMSMP project. So if you’re okay with an authentically aged finish and can give up control a bit, then MMSMP is a great paint choice for you! It’s definitely a paint product that you should try at least once. The results can be drop dead gorgeous! I hope this little breakdown was helpful to you! 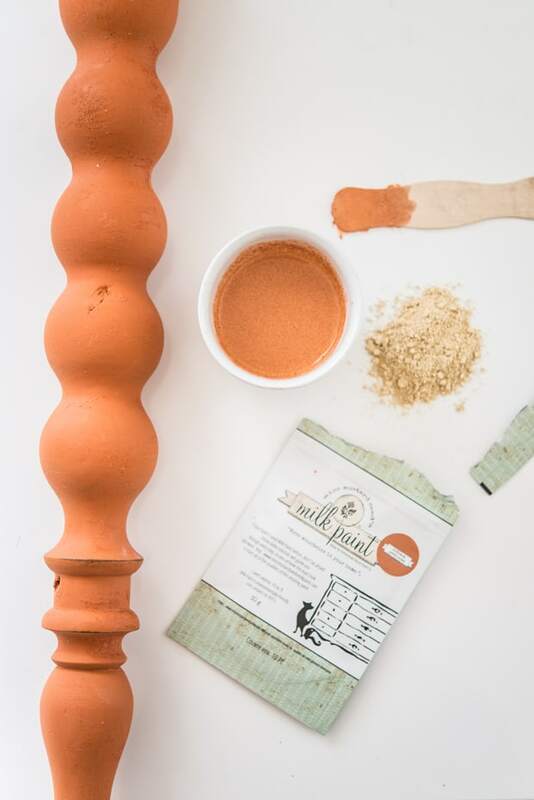 If you have more questions about the two types of milk paint that I carry, feel free to reach out via email, attend one of my workshops and demonstrations, or visit any of my retail locations!